This mouthwatering salad, using fresh dressed crab from the fish service counter, is ready to eat within 15 minutes. Using a small, sharp knife, halve the mango lengthways either side of the large flat stone and cut the flesh away from the skin. Cut the mango into slices. Remove all the light and dark crab meat from the shells and place in a large bowl. 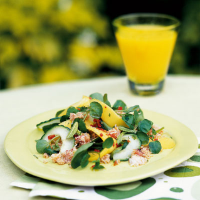 Add the mango, cucumber, mint and watercress and gently mix together. Place the ingredients for the dressing in a small bowl, season and whisk together. Divide the salad between 4 plates and drizzle with the dressing. Serve immediately with lime wedges and warm ciabatta rolls. To remove the seeds from a cucumber easily, cut in half lengthways and scoop out the seeds and watery flesh with a teaspoon.